"Create" is an exhibition of a years work in many medias, I have included a large selection of print pieces but the central piece remains my Metal Work. Exhibiting with two colleagues we have the reputation for one of the most contemporary shows ever staged at the Sayle Art Gallery. 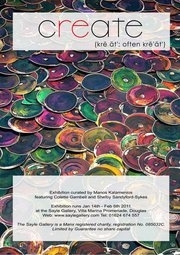 The Friends of the Gallery are always very supportive and this was a very successful show in showcasing this new work.